•	If you have gas furnace that is leaking out gas, open your windows first. Do not light any match. If the odor is strong leave your premises. Turn off the gas valve situated near the gas meter on the gas inlet pipe. You can use a wrench to do so. Call the gas utility or fire department. •	The older furnaces used to have pilot light for ignition. 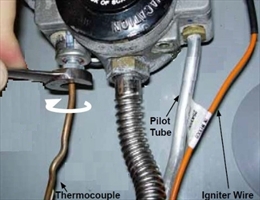 If the pilot light do not stay lit for long then the thermocouple attached to it have turned loose. They also could have turned faulty. The pilot orifice is clogged or flame is at low. The clogged orifice can be cleaned by poking a thin wire in it. Check the flame sensor to ensure it is working properly. If the pilot light gives a yellowish flame instead of blue one, it could be due to CO (Carbon Monoxide) leakage. Call a contractor soon. •	Sometimes the valve of the furnace is not on or it has turned faulty. Therefore it does not open to let the fuel come out and reach the burner. In that case you have to replace the valve. In case of a working valve that is on, the lug or handle should be in line with the gas pipe. If you have oil furnace always ensure that there is enough supply of fuel. •	Sometimes the heat produced by the furnace is not enough. The problem may lie with improperly set thermostat or a faulty one. The room registers may also not be open to give out hot air into the rooms. •	If your furnace cycles on and off too often, it can be caused by dirty filter, faulty thermostat, and defective flame sensor. •	Sometimes the blowers run without moving air. This is because of a broken belt which needs to be replaced. Sometimes the fan motors and fans also need oiling. Oil the bearing according to your manufacturer’s instructions. There are times when the blower runs continuously. This is caused by thermostat setting or by the limit switch. Check the thermostat. If the fan switch is turned on, then change it to off or auto. If the problem is with the limit switch. 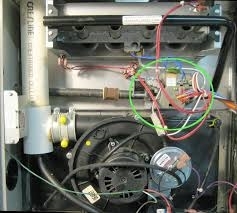 Call a furnace repair technician to adjust the limit switch. You can do it yourself too by following the manual. o	The metal in the duct work conduct sound from the furnace unit. You can ask a contractor to insert flexible insulation duct work between the furnace and the duct work runs. o	Pinging or popping sound coming from the duct work is caused by thermal expansion or by air passing by a loose flap of metal. You have to locate the area from where it is coming out and make a small dent in the sheet metal to provide a more rigid surface. o	If the furnace cabinet makes rattling noises, the cover panels could have got loose. o	If the blower is making a grinding noise, the motor’s bearings could be shot. If the oil burner goes on and off too much, clean or replace the filter. It also could be caused due to non-working thermostat and flame sensor. The heat sensor in the stack may have directed the unit to shut off.